Of course I have some favorites that I make often. There are also recipes that were once a favorite, but I haven’t made in a while. That’s why I love searching through all of the recipes. There are also meals that are more for summer or winter. I don’t know about you, but I’m ready for the summer meals! As much as I love soup to warm me up in the winter, I’m over the cold weather. For breakfast this week I plan on making Western Quesadillas, PB2 Pancakes, Stuffed French Toast and Biscuits and Gravy. The lunch recipes are Turkey Hummus Rollups, Thai Chicken Skewers, Wedge Salad and a Cuban Flatbread. The Cuban Flatbread is actually made for dinner, and then you can use the leftovers for lunch. For dinner I included recipes for Chicken Alfredo Baked Penne, Bacon Wrapped Pork Tenderloin, Deconstructed Chicken Gyro, Creamy Pasta with Spinach and the Cuban Flatbread. Here is the meal plan with clickable links right to the recipes. 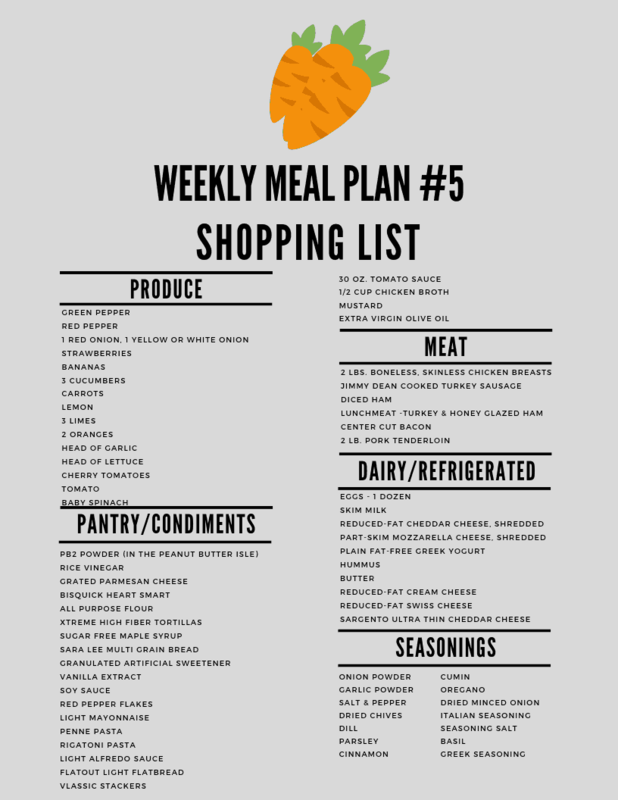 After the meal plan is the printable shopping list.